Africa39 author, Hawa Jande Golakai. 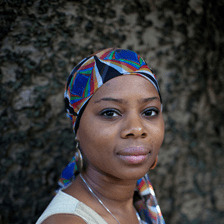 Hawa Jande Golakai was born in Liberia and has lived in several African countries. Her debut novel, The Lazarus Effect, was shortlisted for the 2011 Sunday Times Fiction Prize, the University of Johannesburg Debut Prize and longlisted for the Wole Soyinka Prize. She works as a medical immunologist and is currently completing her second novel. Africa39 authors, Hawa Golakai and Chibundu Onuzo in conversation (New African Women Writers Rising). Hawa Golakai in conversion with Yewande Omotoso. I’ve always as a child been obsessed with crime, how things work, due process, death, those were things that I was never squeamish about. I was never a girl who ran from blood, like animals and all that stuff. I used to love messing with all sorts of living creatures and I think writing crime is like a bridge between what I do as a scientist and what I do as a writer because I like to tackle things that other people may find fearful; but to present it in a way that they may actually see that it’s not really fearful but it’s actually more like a part of daily life. So crime really is a cross cutting in any society, I don’t care where you live in this world. […] I think with the way the world is now, crime is becoming a fascination for the public. So I think writing crime for me now, it gives me a lot of satisfaction personally and also knowing that there’s a huge readership in the area of crime now because people are getting more and more interested in how the law works, and how people who tackle crime work and how forensic scientists work. The whole process of crime has now gotten to be sort of a sensation globally. And I always read crime, it is my favorite genre, and you know they always say, write what you know. And so, for me, that comes easily. Hawa Jande Golakai’s debut novel, ‘The Lazarus Effect’.